It’s (finally) published … and, available on Amazon in both printed ($9.99) and Kindle ($3.99) versions. You probably already know that ranking well in the Kindle bookstore relies heavily on positive reviews. When Adrian J. Cartwood decided to make some personal changes in his life in order to get out of debt, he didn’t realize that in less than a decade he would amass over $7 million in wealth. In “Share Your Number: How Much Money Do You Need to be Happy?” (ISBN 1453888004), Cartwood has partnered with freelance writer Debbie Dragon to share his secrets in hopes that readers will also find success. “Share Your Number” is designed to help readers find a purpose to their lives, which will excite them into action, argues Cartwood. His goal is for people to realize there are possibilities that are bigger, more important and more fulfilling than their current 9-to-5 job allows. The book aims to help readers avoid potentially devastating financial mistakes while assisting them in determining how much is needed to live a dream lifestyle. Readers are introduced to a process of steps designed to achieve one’s goal of financial independence and wealth. These steps vary from simply calculating the number you feel you need to selecting investment tools and discussing your financial plans with like-minded people who can offer support in reaching that number. Cartwood was inspired to write the book based on the experiences with his own personal success and struggles. He believes this book can be regarded as a precursor to other personal finance books because it is the only book that aims to help readers visualize their personal goals as a clear-cut financial number to work toward. His book takes the process a step further by showing people exactly how to get their cash into the bank. Cartwood explains that there are thousands of personal finance books informing people how to save money over the course of their working career; his approach differs in that instead of saving for the future, he details how to make money. “Most people tell you how they did it and charge you for their secret system, which generally involves saving in a retirement fund or trading shares. I started out $30,000 in debt and made $7 million in seven years through several businesses, property investments and joint ventures,” says the author. 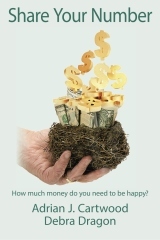 “Share Your Number: How Much Money Do You Need to be Happy?” is available for sale online at Amazon.com and other channels. About the Author: Adrian J. Cartwood found himself $30,000 in debt, and knew he needed to change something. He decided to do some personal accounting to figure out how much money he needed to live the life of his dreams. After just seven years, Cartwood accumulated more than $7 million in his personal accounts. He now spends his time teaching others how to do the same thing. @ Neil – Don’t forget to write a review so that I can send you a signed copy! Thanks Scott – writing the book was easy … publishing it (via Amazon’s CreateSpace) turned out to be a far bigger challenge than it needed to be. My next book will be Kindle only (maybe other eBook formats, as well). Well at this rate I will finish this book by mid-morning. Congrats on the book I’ll be sure to give it a good review after I finish it! Purchased, just need time to read it. Friday’s flight to Memphis should work for that. @ Chris – Please give it an honest review … then, don’t forget to send me an e-mail (ajc AT 7million7years DOT com) so that I can arrange to send your signed copy!